Hally Berry wearing Adeler diamond stud earrings to the 2011 Jenesse Silver Rose Auction and Gala at the Beverly Hills Hotel on April 17, 2011 in Beverly Hills, California. One pair of two toned Diamond stud earrings featuring a centrally bezel mounted round brilliant Diamond surrounded by a frame of round brilliant Diamond melee that are pavé mounted in white gold. 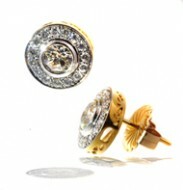 The center Diamonds are 1.53ct (tw) and the surrounding Diamonds are .63ct (tw). The clarity and color grades of the Diamonds are SI1/GH. The undergallery is in yellow gold with decorative cut outs and a high polished finish. This is a trademarked Jorge Adeler custom designed pair of earrings.